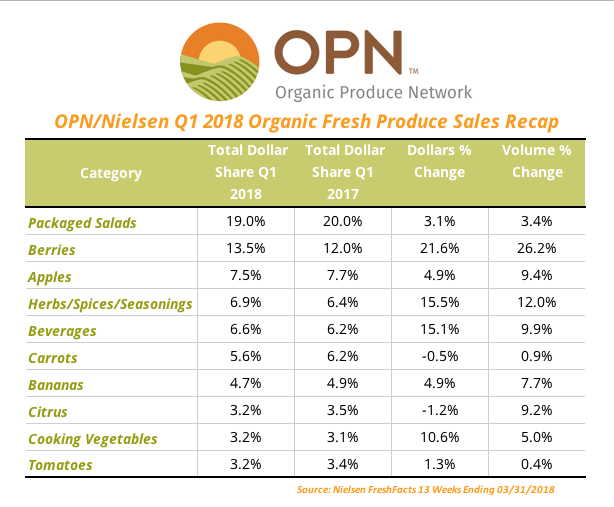 Teaming with marketing research firm Nielsen, the Organic Produce Network analysis of organic fresh produce sales at retail stores across the country for the first quarter of 2018 showed organic fresh vegetables accounted for a larger portion of organic dollars than fruits ($632 million vs $400 million). Other organic items sold in the produce department including herbs, spices, beverages and dressings totaled $205 million, according to Nielsen, for a total of over $1.2 billion in organic produce sales for the quarter. Organic berries (strawberries, blueberries, raspberries) continue to see explosive growth, making up 13.5 percent ($166 million) of all organic fresh produce sales and over 40 percent of all organic fruit sales. More importantly, the organic berry category realized a 21 percent increase in dollars vs last Q1 of 2017 and a 26 percent growth in volume compared to a year ago. Organic packaged salads continue to dominate organic fresh vegetables sales, topping a quarter billion dollars in the first quarter of 2018. According to Nielsen data, more than 80 percent of organic produce dollars come from UPC items (like packaged salads and berries), compared to only 57 percent for conventionally grown produce items.